This is a rare collectible vintage Mughal Damascened Rajput Knife dagger/ khanjar Deer face. A beautiful (Silver) hand Carving of koftgari artwork on it with excellent condition and the damascus steel blade edges has been blunt. 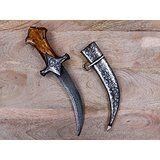 Beautiful Vintage Antique Look piece, Dagger for collection, Gift or Decoration Purpose Size - 1 Feet (Approx) Weight - 350 Grams Spritual Gift, Wedding Gift, Decorative Gifts, Gift For Grandpa, Gift For Fathaer, Home Decor Gifts.